Well, almost three months without an entry. It’s not that I haven’t had anything to write about, it’s just that for the past two months or so I’ve hardly had time to scratch myself. Anyhow, enough of my tales of woe. These are the two side-tables I finished a while ago. The first is the combined goma-gara and sakura pattern I described in the previous entry. The table body is kauri. 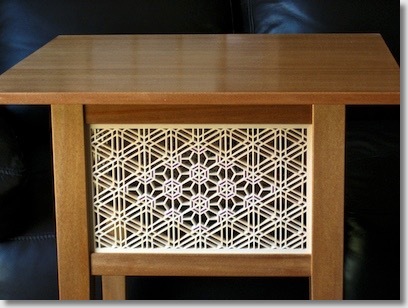 The table top is 450x450 mm, and height is 700 mm. The top is 22 mm thick, tapering out from the table body to 12 mm at the edges. 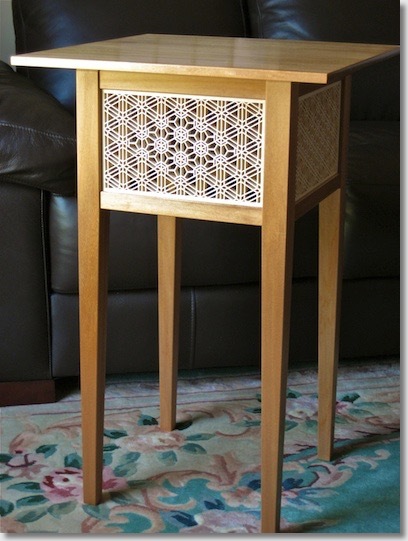 The design itself is very straightforward, as is the joinery. The top is attached with shop-made buttons. 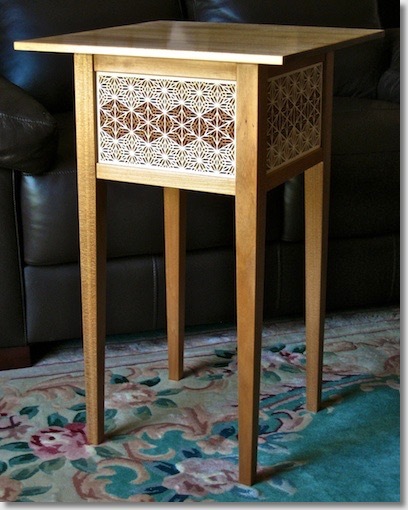 The legs were hand-planed to a taper on two sides. 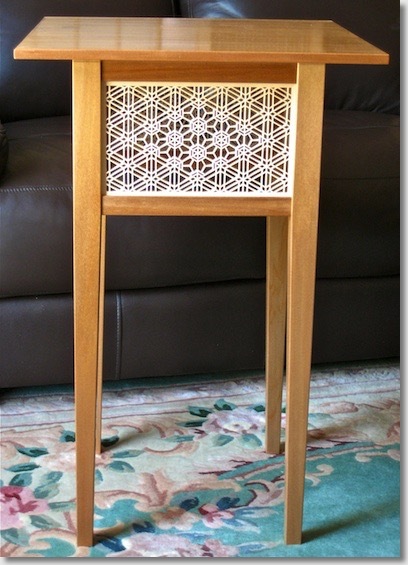 To me a more complex and stylised design would have been far too overwhelming with the intricate kumiko pattern. 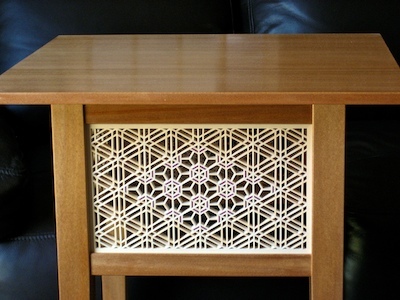 The second side-table has the kawari-yaezakura pattern. The front panel is entirely kawari-yaezakura, while the panels on the sides and back have a central kawari-yaezakura band on an asa-no-ha base. 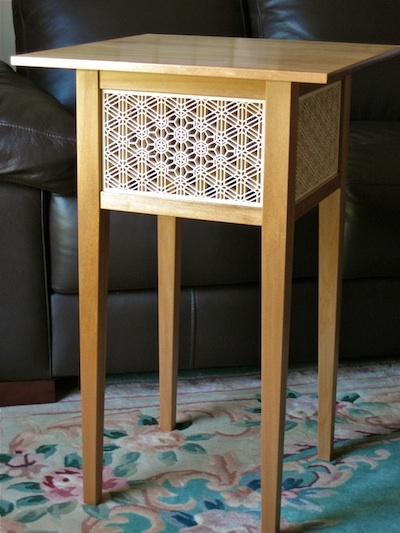 The light timber in the kumiko pattern is Victorian ash, and the red timber is red cedar. 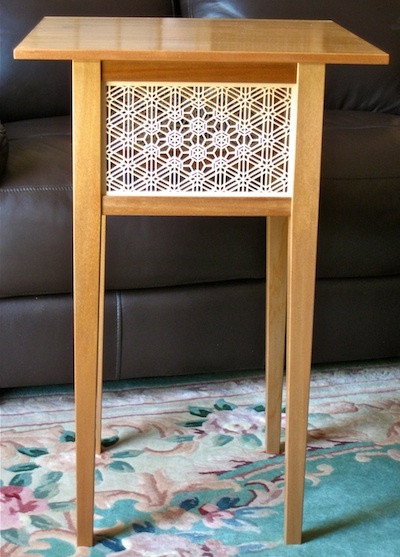 The star within the pattern is made simply by alternating the two different coloured wood types. The size is the same as the other table. Work permitting, I’ll try to be a bit more regular with my blog entries. Hopefully no more three-month gaps.